This interactive presentation contains the latest oil & gas production data from all (12080) horizontal wells in North Dakota since 2005, through November 2016. After the surprise increase in October, oil production in North Dakota dropped again in November, with a modest 1% (10 kbo/d), to 1.034 million bo/d. The surprise in November was the number of new wells on production (see “Well status” tab) : 82, vs 51 in October. The last time it was that high was more than a year earlier. Given that new wells typically also show growth in production in the 2nd (calendar) month on production, this is likely to have some positive effect in December as well. Still, I estimate that even this number is too low to sustain production above 1 million bo/d, and that the general trend in the coming months will be further downwards. [Update:] Mr. Helms, during his webcast, mentioned that during the winter months many conventional wells will be shut-in, and that cold winter weather after November has lead to reduced fracking, so these factors will probably accelerate declines during these months. The large number of new completions in November lead to a drop of 30 drilled, but uncompleted (DUC) wells, to about 840. In comparison, the current number of rigs (around 40) is capable of drilling about 60 wells per month. The average downtime declined even further in November. I mentioned last month that wells were shut-in on average for 2.0 days in October (3.2 in Sep), but in November this was just 1.7 days. 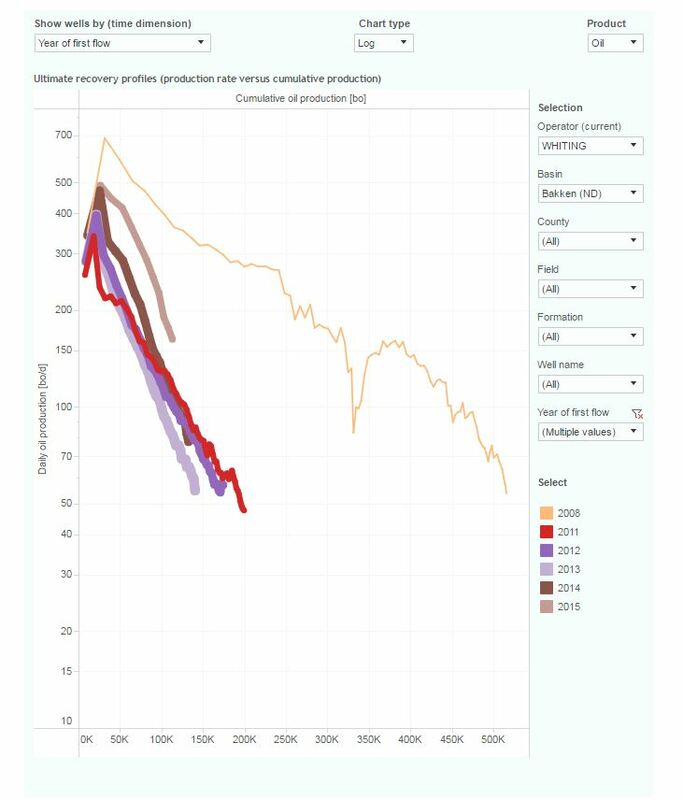 This “Ultimate recovery” overview shows the by now probably familiar trend of ever higher initial productivity of new wells. The 2 curves at the top represent the average performance of the wells that started in the 2nd and 3rd quarter of 2016. They clearly recovered more oil in the first couple of months on production than earlier wells. But also these wells appear to start a similar decline path afterwards, towards their ultimate recovery. This can be nicely seen for the wells that started in the 2nd half of 2015; they also extended their initial production, but are now declining at a similar slope on the plot as wells from 2010-2014. 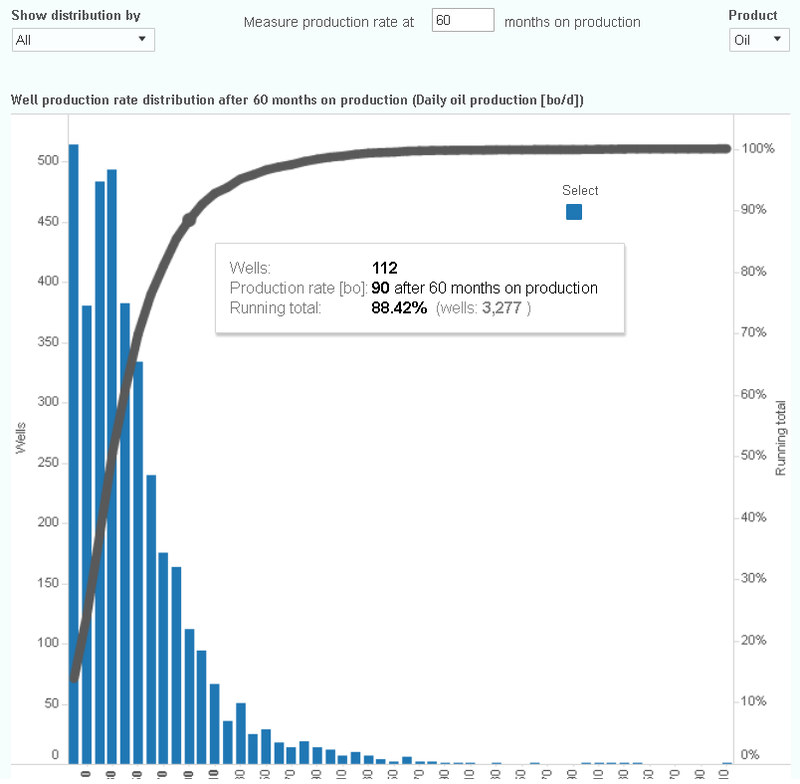 In the 2nd tab (“Cumulative production ranking”), you can see all those 12080 wells ranked by cumulative production; 9 of them have produced more than 1 million barrels of oil, of which 2 even more than 1.5 million barrels of oil. These are exceptional results, as the median is closer to 150 kbo, but of course most wells are still producing. I’ve updated the “Well status map” overview. It’s now very easy to find there the detailed location and status of all horizontal wells in North Dakota. For example, to see where exactly in North Dakota new wells started production last November, just click on the legend “3. First flow”, or select that status in the selection box. After doing the latter, the map will automatically zoom in to the relevant area. You’ll notice in this way that all the wells that started in November were in the core area. Most DUCs are located there as well, although you’ll see some outside of the core “triangle” as well. The size of the dots on the map reflects the number of wells that are part of that operator/field/formation & status combination. This makes it easy to quickly find the most relevant areas. As usual, tooltips provide more info. I’ve added a new overview at the end of this presentation: “Water ratio”. Here you can find the water/oil (or gas, if you select gas with the “Product” selection) ratio for all wells that have water reported. That means about 98% of the wells in North Dakota, as this data is only not available for recent, confidential wells, until the NDIC releases the annual statistics for 2016. 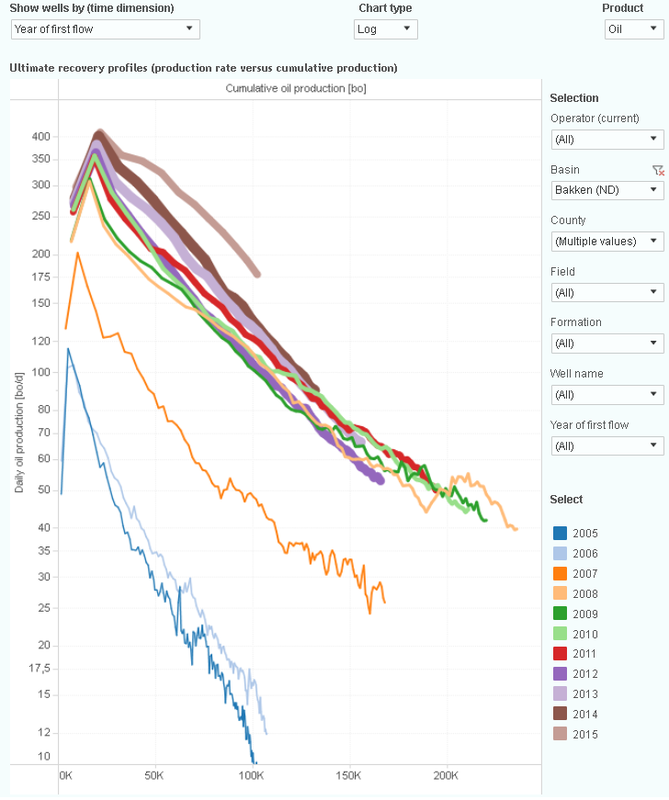 What I found interesting in this overview is that in general not a lot of water is produced (about 1 barrel of water, for each barrel of oil), but that for very old wells (2005-2007), this ratio has been rising quite steadily and steeply in recent years. It will be interesting to see if later wells can avoid this fate. So far wells after 2007 appear on a different track. I haven’t planned another post yet, although I’m considering to update my “Projections” post later this month. I’ve made an update to the “Well status map” overview, and added text about this overview to the post. I consider it a powerful way to easily see where things are happening. great water cut data, Enno! It will be interesting to see the water cut for Permian and compare. Did you notice the sharp increase of gas for the the new wells? Is this because they now have the pipeline or they are drilling into overpressured sweetspots? > great water cut data, Enno! > It will be interesting to see the water cut for Permian and compare. Yes, but unfortunately I don’t have produced water data in Texas. I do have it though for New Mexico, so for that part of the Permian we will soon be able to check this. > Did you notice the sharp increase of gas for the the new wells? Yes, this is indeed quite remarkeable. > Is this because they now have the pipeline or they are drilling into overpressured sweetspots? > GOR might be affected by many issues, one is that earlier wells just flare everything? — Enno do they count gases flared? In the gas production I show here, I include all gas production, including the gas that is flared. The only exception is for the gas production data for confidential wells, as for these wells only the actual gas that is sold is reported. However, once the annual reports come out (in July each year), the real production is available, also for those previously confidential wells, and that is what I use then. Sweet spots in N. Dakota are no longer over pressured. Increasing GOR is a sign of depletion. BTW, there are at least a dozen of wells in Bakken that tops 1MMBO — according to the data here. I’m sorry Nu but I must disagree. The energy balance equation below which relates cumulative oil Np to original oil in place control volume N and has (Rp-Rsoi) produced gas oil ratio minus initial solution gas oil ratio in the denominator; works everywhere. 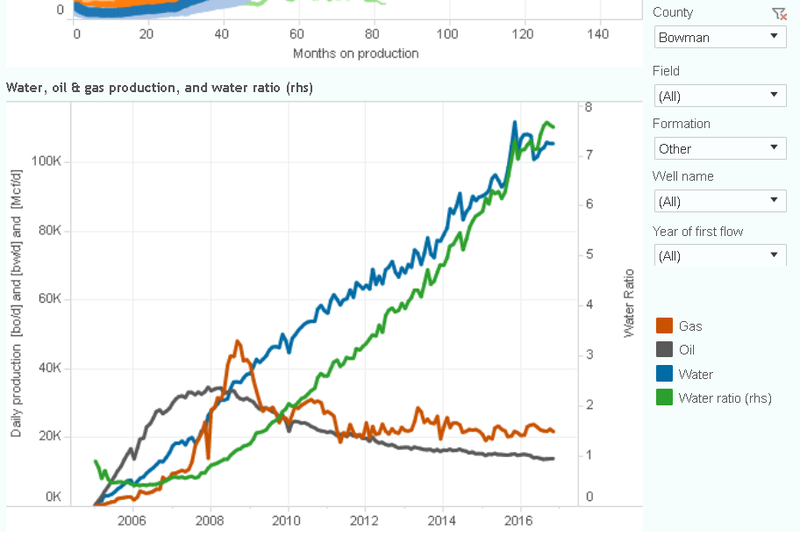 So far, Enno’s data does not suggest consistent increase of water for the Bakken which is usually the case for water drive conventional reservoirs. GOR might be affected by many issues, one is that earlier wells just flare everything? — Enno do they count gases flared? Thanks for those excellent links. But no matter how complex we try to make it; conservation of mass and energy will apply; regardless of our inability to measure it. Stuff that tickles your cerebral cortex on a Friday. I’m not going to go to the trouble of digitizing their 900 MBOE type curve and trying to back out the oil from the GOR model- too much time wasted already. What I want to show is that you’re left with a 30-50 BOPD well after you get your money back. There’s no type curve… just unsubstantiated big EUR numbers that get bigger every year! One interesting thing in their release this week was that they are going to use lift technology to ‘accelerate’ recovery at much cost… so expect bigger 90/120 day well performance and bigger declines thereafter. Over the weekend I had a closer look at the performance of older wells in North Dakota. I found it interesting that older wells (esp 2005/2006 vintage) appear to have higher EURs than later ones. I noticed that wells in Bowman county (ND) declined rather differently. I’ll present my findings with the help of a few screenshots. The first image shows that in 2005-2008, oil production in Bowman county (shown in orange) represented a significant part of total oil production in North Dakota. I belief that most of these wells were drilled into the Red River formation. 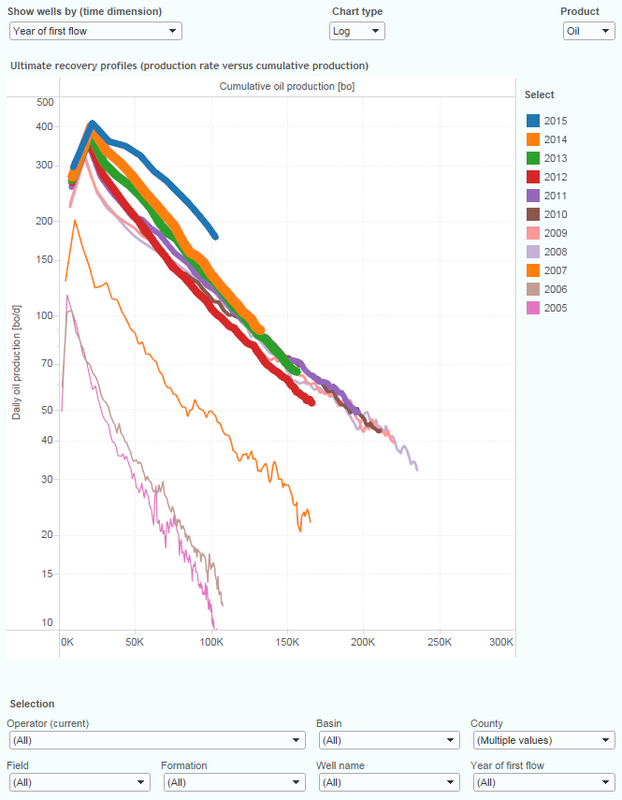 The following image shows that the horizontal wells in Bowman county, especially the 2005/2006 vintages, but also the 2007/2008 vintages, were really good compared with the average well performance in North Dakota. The early ones have on average oil URs over 600 kbo. You can also see that well performance in Bowman county has deteriorated over the years, and in 2016 no new wells were brought online here. Finally, I was interested in identifying the impact of refracking on these wells (all wells in ND outside Bowman county). Using the FracFocus database, I found a small number (134) of wells that appear to have been refracked almost for certain. I don’t think it is the full number, but I do think it represents a significant part of the wells that have been refracked in ND. With these 134 wells excluded, the Ultimate Recovery profiles of the remaining wells are shown in the image below. So, this includes all horizontal ND wells, outside Bowman county, that have not been refracked according to FracFocus. Suddenly, the lower declines of wells with small production rates have mostly disappeared. – Denbury (which acquired production from ConocoPhillips, in the beginning of 2012). Water production has indeed increased rapidly in Bowman county, and the water/oil ratio is now over 7, see pic below. I think the Cedar Hills Red River wells have been subject to a secondary recovery program. It started with high pressure miscible air injection, which is basically an in-situ combustion process. I think they might be chasing it with water now I do not know. 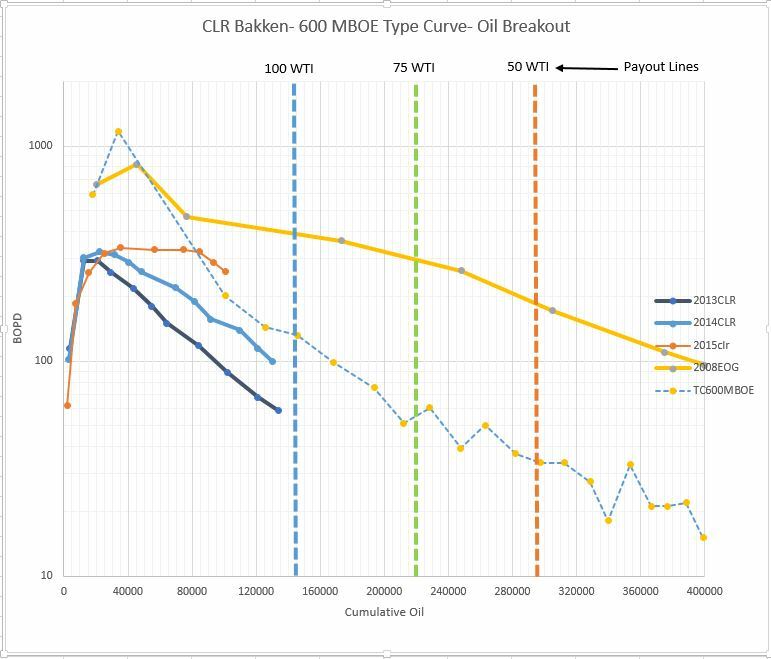 Your rate versus cumulative logarithmic graphs tell excellent tales in the Bakken. I think WLL is may favorite. Clearly shows the well improvements in EUR over time (sarcasm). 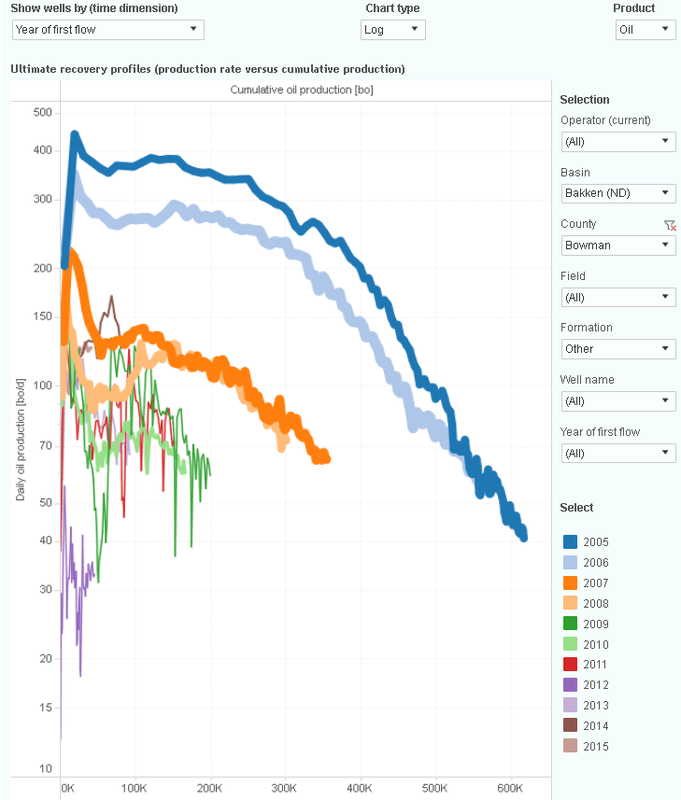 If we look at the well performance in North Dakota, outside of Bowman county, we suddenly see very clearly how average well productivity improved in the years 2005-2008, but not by much afterwards. 2015 wells do show an improvement in initial productivity, but so far it doesn’t look like it will be more than an initial gain, and it seems possible that it actually represents accelerated production, at the cost of later recovery. Your accumulated production data here just have half a dozen with over 1 MMBO. I’ve commented on the thread you referred to. I’ve on several occasions pointed out to Michael Filloon that his Bakken claims are wildly off, and now he clearly posted data that is obviously incorrect. It appears to me that he has been using a flawed dataset all this time. Let’s see his response. Always informative when spirited discussions arise in these matters. Anyway, I just scanned through a few of the more recent presentations from the ND DMR folks and was a little surprised at their numbers. Several months back, their Typical Bakken Well Production graphic showed 94 barrels oil per day output at the 5 year mark. The more recent, Sept. 2016 Presentation has, on page 8, 110 bpd at the 5 year mark … dropping down to 50 bpd at 16 years online. I realize these numbers are vastly higher than what your data shows, but it’s another, IMHO, example how statistics can be slightly more … fluid, than one may suspect. Your extensive North Dakota data unquestionably shows complete, verifiable production numbers. But, if the ND folks utilize what they describe as a “Typical Bakken Well”, variation is sure to show. Specifically, if one looks at the single, 60 day IP graphic that is included in almost all DMR presentations, there are a Kardashian-Size Asston (KSA) of poorly performing wells that you may be including in your dataset, but the ND folks do not as they are not considered “Typical” wells. As is my inclination, I do not feel there are right/wrong positions in these matters as long as both clarity and understanding are present. Yeah, 110 barrels per day 5 years out sure seems like a lot. “Several months back, their Typical Bakken Well Production graphic showed 94 barrels oil per day output at the 5 year mark. Only about 12% of the ND wells so far did still more than 90 bo/d after 5 years on production. See the image below. This percentage drops to 7% for a rate of 110 bo/d. If “typical” actually means the top decile, hasn’t the word lost its meaning? It would be the same as saying that the typical US household has a million $ of net worth. Only 3% of the ND wells did 200 kbo cumulatively, after a year on production. Unless, of course, our friend Boe has joined the party again; then it would be a few % more. I consider it misleading, as it is so easy to misinterpret. “Typical” is more commonly used for close to average, or median. I find the ND production data very useful and reliable, but their analyses and predictions lacking. … and a quick followup, that Typical Bakken Well profile shows a touch below 200,000 barrels oil first year online. That there are people on Seeking Alpha making unsubstantiated claims is not surprising to me. Can he show the actual list of wells that reached 1 million bo? Anybody can easily falsify the ND well production numbers shown here. ND also publishes annually a list of individual well production numbers, incl. cums. I will publicly give due credit to anybody showing an issue with my data. Just read the comments on Filloon’s SA post that Mr. Sheng Wu linked. I think a huge “Whoops” might be coming from Mike. His numbers seem to be wildly skewed.